This is one of the series that I want to read them all--and hope that Rachelle Ayala keeps on going with--every one is a winner! I haven't read them all in order-but they don't need to be--each can stand on it's own although the same character's can be found in each along with new ones. This one deals with Cait Hart who has been married to Brian for 12 years--but it was a marriage of convenience for both of them. Not that Cait's tight knit family knew--all they knew was that Brian and Cait were essentially living separate lives, and they were worried about it! There are lots of twists and turns and lots of secrets that will be revealed! Can these two make their marriage work? And what are all the secrets that are being kept? Read the book to find out. 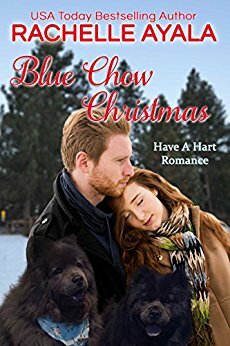 Blue Chow Christmas is Book #4 of the Have A Hart Romance Series. It can be read standalone, although characters from the previous books appear here in supporting roles. Awe, Blue Chow Christmas sounds like a book I want to read. Since it is pg there are no slaughters an such. 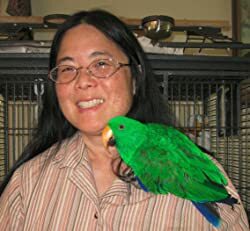 I like when animals are a little piece of the story. My dog is half Chow but only has the fur collar. My daughter would like this too. I think they can make it. I'm all for the under dog. Thanks so much for your warm review. The chow dogs who inspired my story belong to my sister and appear on the cover. I better get book #6 written, hopefully by the end of summer.